Annie befriends a time-traveler from Earth’s future. The title of this episode may be derived from Back to the Future. At one point in the movie, shortly after Marty McFly has arrived in 1955, a skeptical Doc Brown calls him "future boy". The digital readout on Simon's time belt is also similar to the one in the DeLorean in BTTF. One of the themes of this episode is Annie's resentment at being treated "like a baby." This is reminiscent of several episodes of LOTL70 in which Holly Marshall has similar feelings about how she is treated by her father and brother. At 0:06 in the episode, in a rarity for children's television, blood is seen from a nasty gash in Annie's forearm (we are told she received it while swinging from a vine in imitation of Christa). Tom mentions that Annie is 11 years old. At 1:24 in the episode, when Annie asks, "Who are you?" Simon answers, "Cardenas. Simon Cardenas." It seems odd that a kid would introduce himself that way, with the last name first. This may be a reference to the way secret agent 007 introduces himself as "Bond. James Bond," in most of the 007 films. Simon introduces some teen future-slang to the Porters' vocabulary. Most of them are abbreviations of existing English words by chopping off the first or last syllable and speaking only the remaining ones. For example, "stupendous" becomes "pendous". In typical adult fashion, Tom does not quite get the rules of using the youthful slang and, for example, uses "stup" at the end of the episode, causing Kevin and Annie to laugh in embarrassment at him. 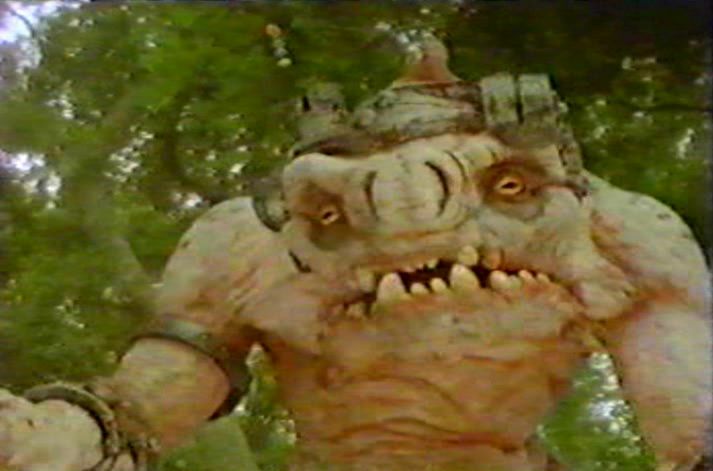 Simon comments that his collision with the cyborg altered his space-time trajectory, so he (and we) are left with no reference as to when/where the Land of the Lost exists. As in "Dreammaker", we see that the Porters are attempting to keep track of time passed by Annie's comments that "back home, it's 1992." Simon comments that San Francisco has been an island since the quake of 2047 and that he himself is from 2062. 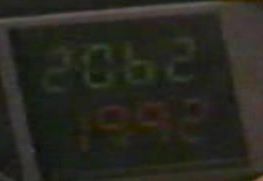 Interestingly, Simon's time belt indicates that he originated from 2062 (as he claims) and that he is now in 1992, the same year that the Porters assume is "now" on Earth. This may suggest that the Porters only travelled extradimensionally and not through time when they came through the portal from Earth. The Myzarian cyborg has some similarities in appearance to the rancor from Star Wars: Return of the Jedi. After a worried Tom goes off in search of Annie in the jungle, Kevin asks himself if he will become an old worrywart when he becomes a parent. I guess this means he is planning to become a parent! Which would probably be normal in a life on Earth, but is he considering that he might be stuck in the Land of the Lost for the rest of his life? If so, perhaps he's hoping to reproduce with Christa! At 4:46 in the episode, we see that Tasha knows how to turn on the boom box and also appears to "hum" the tune produced. Apparently the Porters have taught Stink the game of Simon Says. When Simon Cardenas is introduced to Stink, the Paku says, "Simon say? What Simon say?" Annie refers to Spike the stegosaur as "she." This is the first indication in the series that Spike is female. Even if Spike is female, how do the Porters know it? Simon has a PDA-like device which he uses as a reference tool. On it, he is able to look up information from Sturgeon's Catalog of Non-humanoid Lifeforms. I'm sure writers Janson and Menville used "Sturgeon" as an homage to famed science-fiction author Theodore Sturgeon, who also wrote the LOTL70 episode "The Pylon Express". The fact that this catalog exists in Simon's time means that Earth has somehow had contact with extraterrestrials by the year 2062. At 8:42 in the episode, while he and the human kids are investigating the footprints of the Myzarian cyborg, Stink places his hand in the footprint and then smells his hand. He jerks his head in a startled fashion and makes a strange face while remarking, "Malu. Very scary. Very, very scary." It's a nice, subtle bit about how "animals" have a sense of smell and instinct about other dangerous creatures. Scarface seems to have a glass jaw. He goes down quickly after just two quick socks to the jaw from the cyborg. As the Porters wonder how they can fight something as powerful as the Myzarian cyborg, Kevin quips, "call Sigourney Weaver." 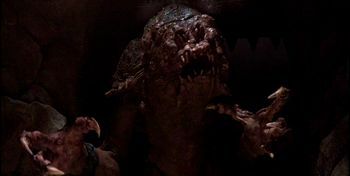 This is obviously a reference to the two films (at the time of shooting) of the Alien franchise, Alien and Aliens. When Annie makes a mocking salute to her father in resentment of being made to stay behind in the tree-house once again, Tasha follows suit with a salute as well. At 16:43 in the episode, Tom, Kevin, and Stink are, for some reason, wondering what Scarface is doing laying on the ground. Tom says "he's healing himself" and Stink comments "Yeah, yeah. Mud good for owies." But Tom just saw Scarface get K.O. 'd by the cyborg earlier in the afternoon. Obviously, Scarface has lain unconscious during this time and is now finally waking up. At 17:45 in the episode, Simon takes a picture of Annie and Tasha with his camera. The ultraviolet flash of the camera causes Tasha a few seconds of blindness. This brief incident may be what causes Annie to recall the Sturgeon catalog's revelation that this model of Myzarian cyborg is sensitive to ultraviolet light, which weakness she uses to their advantage later on. 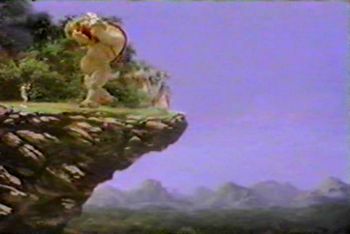 At 18:02-18:25 in the episode, we see a stop-motion animated version of Tasha for the first time in the series as the cyborg picks her up and holds her upside-down. 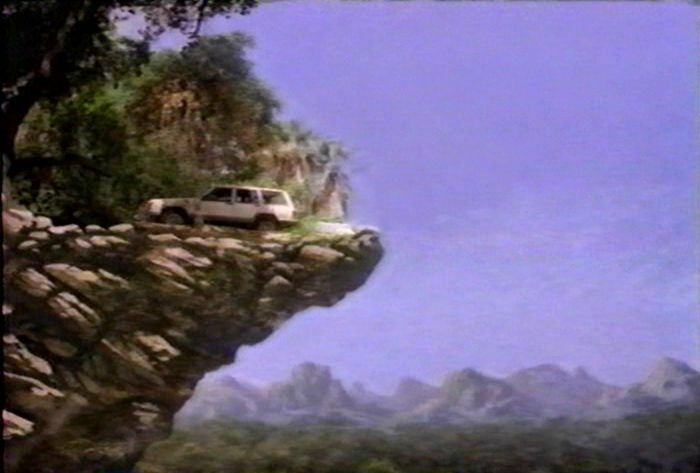 The cliff off which Annie chases the cyborg appears to be the same one seen in the first season episode "Jungle Girl" which hangs above the Valley of Death. Cliff from "Jungle Girl" Cliff from "Future Boy"
I was present for one day of on-location shooting of this episode at Descanso Gardens. I got to meet and talk with the cast members (and share M&Ms!). The scene that ends at 20:16 shows Tom and Annie amicably agreeing that she needs to talk things out with him rather than running off trying to prove she's mature. Well, after the director had called "cut" at the end of shooting it, Timothy Bottoms then grabbed Jennifer Drugan and said "Ok, now you get your whipping!" Or words to that effect. Everyone had a good laugh. It was fun to see the cast joshing around with each other. 8:46 Stink says, "Malu." "Bad." 9:12 Stink says "terire" "Terire" is unknown. From the context of the scene, it would seem to mean "scary" or "frightening". 21:31 Stink says, "Acuba ne." "Farewell." 22:11 Tom says "stup" Tom explains he means "stupendous, stupefying". The joke is that Tom doesn't know that the abbreviated word still has to sound cool. Simon Cardenas' time belt brings him to the Land of the Lost. Of all the places he could arrive, he just happens to appear right next to Annie, who is throwing stones into a pond. 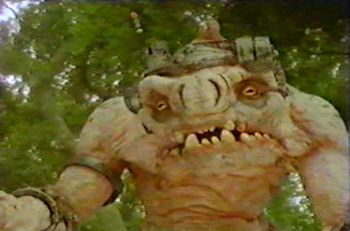 Could the time belt be attuned in such a way that it homes in on humanoid life forms? In a similar vein, how is it that Simon just happens to be from San Francisco, just like the Porters? Simon comments that the coordinates on his time belt indicate that the Land of the Lost is in another dimension from that of Earth. He also says that this means he'll never be able to plot a return course; fortunately, the auto-recall in his suit will kick in in 12 hours and take him back. If someone else were to be wearing the time suit, would it still take them back to 2062? Once again, Christa is missing in action while important events take place in the Land. Gone hunting again?